The Ex-Governor of Rivers State, Mr. Rotimi Amaechi, has accused the Governor of Rivers State, Mr. Nyesom Wike, of diverting N45bn loan taken by his administration. Amaechi made this statement at a special thanksgiving service on Sunday organised to mark the October 25 ruling of the Supreme Court, which brought him into power as governor in 2007. “I borrowed N300bn and I paid N245bn back and I left about N15bn. But now, they are not borrowing to pay contractors. Rather they are borrowing for themselves. Wike replied through the Special Adviser on Media and Publicity to the State Governor, Opunabo Inko-Tariah, described the allegation by Amaechi as malicious and spurious. “On the malicious and spurious allegation by Rotimi Amaechi that Gov. Wike borrowed N45bn to line his pocket, it is laughable. Amaechi himself in one of his speeches said Governor Wike would inherit an empty treasury which was fleeced dry by him. 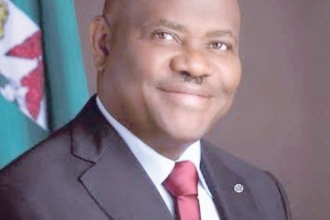 “Therefore, if Governor Wike, who inherited an empty treasury, could achieve the level of infrastructural development we are witnessing today and can also clear the unjustifiable liabilities he inherited from Amaechi as evidenced in his speech,where then did he get the money from to do all that that have put smiles on the faces of Rivers people who were despondent and frustrated under Amaechi if not with the loans he collected with the imprimatur of the House of Assembly? “This obviates the need for any further evidence that the loans collected were judiciously applied and in tandem with the reasons for which they were collected. The allegation has no ounce of truth in it. Rivers people are quite intelligent to be deluded by such cheap lies,” Inko-Tariah said.